This week’s forum focused on the third chapter “Competition and Monopoly” in Kirzner’s book. Much of the chapter was not controversial to an Austrian audience and so there wasn’t the sort of discussion surrounding it as one might expect with a larger mix of mainstream economists. Later (p 108) Kirzner states, “As soon as we draw the cost and revenue curves facing the firm, no matter what their shape, we have created a theoretical case in which all competitive behavior has by definition been ruled out. What is left is neither competitive nor monopolistic (in the process sense), but a problem in allocation.” This means that as soon as we assume the structure of the cost curves or the type of demand curves, we have transitioned away from anything competitive and entered into the world of the Robbinsian maximizer. I think that this analysis goes too far. In one sense I see exactly what Kirzner is attempting to draw attention to, however I do not see why a sufficiently generic supply and demand graph has to be that way. If we follow Kirzner, then even imagining curves sends us into the maximizing world. I think that an economist can look at a static graph and recognize that it is an imperfect representation of a dynamic process. Kirzner then examines how competition can be limited. “[F]or us to speak freely of a lack of competitiveness in a market process, we must be able to point to something which prevents market participants from competing. … What is it, …, which might halt the competitive process? … Competition, …, is at least potentially present so long as there exist no arbitrary impediments to entry.” (p 97) As we can tell, there are several reservations and qualifications in his definition. Furthermore, we doesn’t define the areas of monopoly in a positive sense, e.g., “you’ll know monopoly when….” Instead, he defines a potential absence of competition in a negative sense and assumes that the result is monopoly. Personally, I do not like this approach. It seems that there is too much hedging. Is there a reason to be overly cautious? I do not know. To summarize Kirzner’s position, the pure entrepreneur is a metaphysical concept. It is simply the recognition of a profit opportunity. There is no way that we can stop a person from recognizing an opportunity. As a result, all entrepreneurship is competitive and short of direct brain control, it is impossible to curtail this recognition. Thus, all anti-competitive restrictions have to occur on the level of access to resources. The restriction of access to resources is a decrease in competition. A complete restriction is a monopoly. We talked about the implications of these concepts. There arise two types of monopolies: one created by a government action and one created through the sole ownership of a resource. While we agreed with the first, the group debated the second concept. As an aside, it arose that private property is a legal restriction to the access of resources. I therefore have a monopoly over my car. While Kirzner does argue that monopoly “diverts the entrepreneurial-competitive process into” other markets, I know that he would not argue that we should abolish private property. (p 107) Kirzner states, “For us monopoly means the position of a producer who is immune from the threat of other entrepreneurs’ doing what he does.” (p 106) However, it seems that for Kirzner, monopoly is not necessarily a bad thing. I suspect that he will cover this in more detail later in the book. Mises argues that intervention in the market distorts the market. When the government buys pencils, it is not disrupting the normal market process and thus this is merely a shifting in supply and demand curves. When the government imposes rules that prevent the market from doing its job, we have permanent discoordination. For example, a maximum price set below the market price will create a permanent shortage. I see Kirzner using the same logic in the background of his analysis. When a monopoly exists due to legal barriers, we see the market unable to perform its job and this is bad. If there is a monopoly that arises from ownership, then the market curves shift and the market adjusts. The next item that we discussed was the idea of monopoly rent. This is the return that a monopolist gains because he is a monopolist. It is an addition to the return on the other factors of production, in which we are including entrepreneurial profit. We found it difficult to separate these rents from the concept of entrepreneurial profit. Luckily, Kirzner does not use it in his welfare appraisal of the monopoly. Instead, he uses “the speed and smoothness with which misallocations can be discovered and corrected” (p 112) as his basis of comparison. This definition directly parallels Mises’ definition on interventionism, where the focus (for monopoly) is directed to the obstacle to entry. We then touched on some relatively random points. We found them thought provoking and interesting enough to comment on. Kirzner states, “for our notion of monopoly the shape of the demand curve facing the firm is of little significance. … [T]he significance of monopoly does not relate to the theory of the firm at all. (It is because of this that the shape of the demand curve is irrelevant. )” (p 108) The importance of this comment is that the mainstream focuses on the firm (and the industry) and the consequent shape of the curves that the firms face. Austrians have long rejected this static view of Industrial Organization. Instead, we focus on the competitive process, on the action, on the verb. Kirzner has a discussion on Monopolistic Competition, in which we basically throw the concept out. 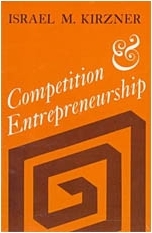 In characteristic Kirzner fashion he cannot make a strong, direct statement and instead says, “The position developed thus far in this book makes it impossible for me to accept this approving judgment on the theory of monopolistic competition.” (p 113) More directly he states, “the theory of monopolistic competition was on balance a decidedly unfortunate episode in the history of modern economic thought.” (p 114) The problem was, of course, the fact that when it threw out the old perfect competition model, it left out the competition (in the Austrian sense). Kirzner then has a nice discussion (pp 115-117) on how only in disequilibrium does product differentiation exists. There is no reason to change product quality in a world of equilibrium. Finally Kirzner compares his concept of the entrepreneur with that of Schumpeter’s concept. They both reject the model of perfect competition. Schumpeter does so on the grounds that entrepreneurs are disruptive to all equilibria. They create something new which then explodes all the old economic relationships. Kirzner does not deny that this occurs, but is merely a subset of his “alertness to hitherto unnoticed opportunities.” The difference then rests on Kirzner’s emphasis. He says that the primary function of the entrepreneur is to coordinate resources, the result of which is the movement towards equilibrium. For Schumpeter, the coordination process is secondary and mundane. The next meeting has been changed. Instead of meeting in 2 weeks (October 14th), it will convene in 3 (October 21st). This development is unfortunate for me since that is the day that we have scheduled the trip to the hospital for the new (girl) baby’s arrival. Since the surgery is scheduled for the morning, in theory I could make it to the afternoon meeting. (Yeah, right!) So I will try to recruit someone to write up a summary for that session. We’ll see.